I have long been in love with makeup and hence, primers are my old favorites. I use primers on a daily basis as they make my skin soft and smooth while giving me a clean and fresh look throughout the day. On a regular day, I use primer and top it up with my go-to BB cream. As a daily essential, my primers need to be effective yet affordable. That is why when I saw this Pre Makeup Base from Coloressence, I picked it up immediately. 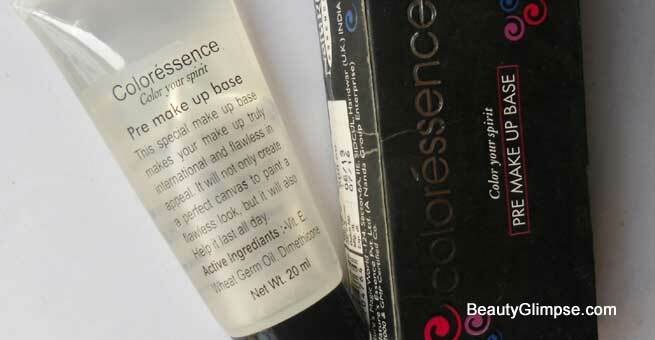 Read on further to know how the Coloressence Pre Makeup Base worked for me. What Is A ‘Pre Makeup Base’ Or ‘Primer’? As the name clearly suggests, a ‘pre-makeup base’ or ‘makeup primer‘ is a unique beauty product that makes your skin makeup-ready by ‘priming’ it or ‘creating a base’ for it. 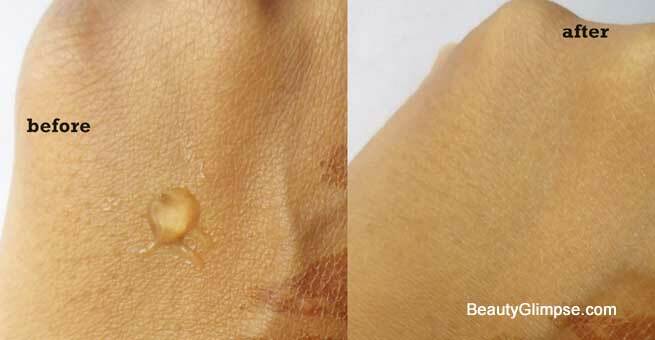 It makes your skin smooth, minimizes pores and fine lines, and hides all other imperfections to prepare it for makeup. It also increases the staying power of your foundation and makeup. In short, a pre-makeup base or primer is really essential for makeup-addicts. The Coloressence Pre Makeup Base is a professional range product intended for creating flawless makeup. This special makeup base makes your makeup truly international and impeccable in appeal. It not only creates a perfect canvas to paint a flawless look but also helps it last all day. It is an oil-free product that helps reduce the appearance of fine lines and pores. It can be worn alone or under the makeup to increase its longevity. The comprehensive list of ingredients used in Coloressence Pre Makeup Base is not present in the packaging. However, it comes with a mention of the active ingredients, which include vitamin E, wheat germ oil, and Dimethicone. It is a 100% vegetarian product with no presence of animal ingredients. Coloressence Pre Make up Base comes in a tiny see-through plastic tube packaging with a black screw lid on the top. There is a black external cardboard carton in which all necessary details about the product are mentioned clearly. The transparent packaging allows you to see the product inside so that you have an idea of how much product is left for use. The packaging is cute and travel-friendly enough as it fits in my handbag perfectly. It is a colorless product with a gel-like consistency and smooth texture. It goes smoothly on my skin and feels extremely light. Also, it does not have a fragrance at all. So, it will not bother people with a sensitive nose. The very first thing that caught my attention is that a tiny amount of the Coloressence Pre Make Up Base is enough for the application. After applying it, my skin feels silky smooth and my foundation glides effortlessly, giving my skin an airbrushed finish. I have whitehead-prone combination skin with an extremely oily T-zone. I also have open pores on my nose and chin. But this primer mattifies the oily areas of my skin well and keeps the shine away for around 4 hours. If you stay in an air-conditioned environment, the oil-controlling effect will be for even longer. It makes my makeup last longer and also keeps it fresh the entire day. I have used this primer under liquid foundation, BB cream, and tinted powders, and all of them have lasted really well. As I have combination skin, certain foundations settle in my pores. But this primer does not allow my foundation to settle in the pores. Rather, it fills the pores and reduces the appearance of fine lines. Though it does not give my skin a poreless finish, I’m still happy with the results. Moisturize your facial skin well. Take a small amount (pea-sized) of this primer and apply thoroughly. The Coloressence Pre Make Up Base smoothens out the skin, reduces fine lines, makes the foundation glide effortlessly over the skin, and increases the staying power of the makeup. The price is affordable and one tube lasts for around 4 months if used daily. Though you cannot expect a poreless finish, this primer does everything else it should do and I am really happy with the results. I’ll definitely recommend it to everyone.